How do you use Facebook ads to generate qualified leads and what are the best practices when you design them? Here's how to avoid a Facebook fail with your ads. Whether you're a content marketing veteran or a newcomer, it's always helpful to revisit your strategy. Try these great content marketing tips. Building a webinar sales funnel from scratch can be profitable, but daunting. 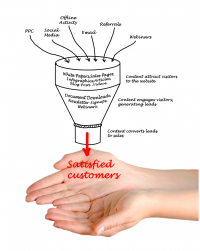 Take out the guesswork of a powerful sales funnel by including these five basics. What is the purpose of a website? They aren't just nice to have. When done correctly, websites are important business tools to help you grow your profits. Only a social media expert can help you get the best possible results, and your receptionist isn't one. Learn how to delegate social media the right way. The future of marketing is anyone's guess, but recent tech trends may give a little insight. Discover the top trends shaping the future of modern marketing. To improve your open rate, check out these best cold email subject lines. They're sure to intrigue your subscribers. Click here to reveal more info! If you want to boost your business check out our branding 101, it's the perfect guide for beginners. Click here for more information on the topic!